Signs of the Times, an industry trade publication have included a small feature in their April issue of a renovation undertaken last fall. 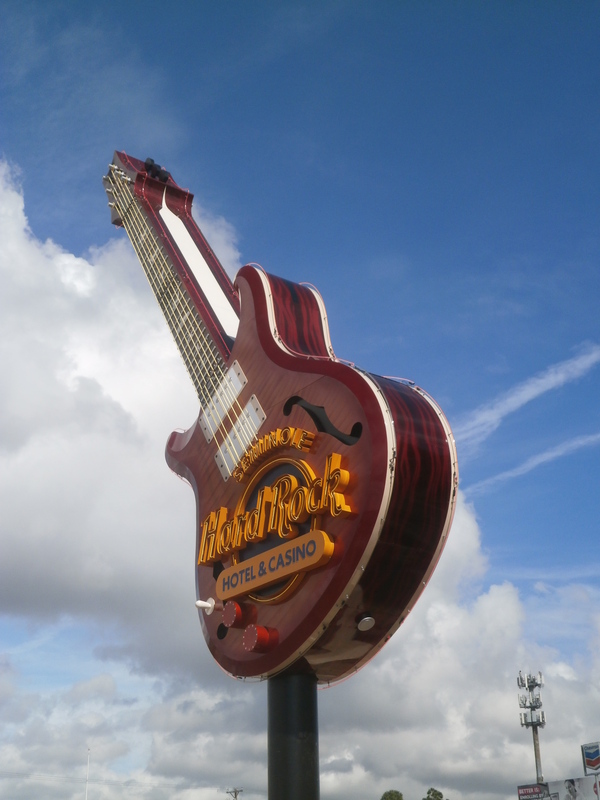 The ST Update summarizes how Gulf Coast Signs of Sarasota, Inc. (GCS) was tasked to fully refurbish the 35-foot tall iconic Guitar Sign at the Tampa Seminole Hard Rock Casino & Hotel. The guitar was disassembled on site, loaded on trailers and transported to the GCS facility. The sign finish was completely stripped then body work was performed prior to priming before the new custom paint finish was applied using high-end paint systems, House of Colors, Matthews MAP and Mathews HP Polyester clear coat, plus new neon, transformers and wiring. The renovated guitar was then transported and installed at the new entrance. The renovated Guitar, thanks to top notch dedicated GCS team commitment to excellence sets new quality standard worldwide. That is why customers reach out to GCS for challenging high-profile projects.